Fresh ham with herb gravy is a great choice for Christmas dinner, especially if you have a crowd. Served with mashed potatoes, roasted apples or pears, and a green veggie, ham can make a festive holiday meal. Modern-day pork is very clean meat. Many old recipes suggest cooking to a very high internal temperature to guard against trichinosis, but that’s no longer necessary. After resting, this ham will have cooked sufficiently yet will still be juicy. Kids love to get their hands messy and can help you stuff the ham. Trim the fat to an even 1/8-inch thickness. 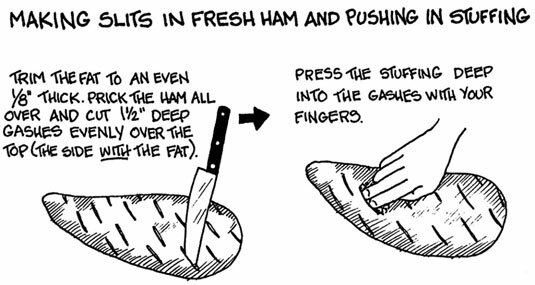 Prick the ham all over and cut 11/2-inch-deep gashes evenly over top of the ham (on the side with the fat). This will be the “top” of the ham, where you will “stuff” the stuffing. Place the garlic, onion, parsley, celery, thyme, sage, and mustard in the bowl of a food processor fitted with a metal blade. Process to a paste, then stir together in a bowl with the breadcrumbs, melted butter, and spinach to create the stuffing. Season with salt and pepper. Press the stuffing deep into the gashes; fingers work best. Place the ham fat side up on a rack in the roasting pan. Roast for 20 minutes, then turn the oven down to 325 degrees. Begin checking the ham after 4 hours. Roast until the internal temperature reaches 145 degrees (approximately 51/2 hours total cooking time). Let sit at room temperature, covered loosely with foil, for at least 30 minutes. The internal temperature should rise to 155 degrees. Make the gravy while the roast is resting. Per serving: Calories 340 (From Fat 162); Fat 18g (Saturated 7g); Cholesterol 135mg; Sodium 152mg; Carbohydrate 3g (Dietary Fiber 1g); Protein 40g. Flavor the ham with fresh herb stuffing. Pour off any fat and pan drippings and separate out the fat. Place any drippings you have collected (they will be minimal) in a saucepan and add cider. Bring to a boil over medium heat and cook until slightly reduced and thickened, about 3 minutes. Add port, sage, and thyme, reduce heat and simmer for 5 minutes. Season with salt and pepper, whisk in butter, strain into a gravy boat, and serve. Per serving: Calories 58 (From Fat 36); Fat 4g (Saturated 2g); Cholesterol 9mg; Sodium 61mg; Carbohydrate 5g (Dietary Fiber 0g); Protein 1g.